How do I add a new bank transaction? Click on the Cashbook toolbar icon in the top left corner of your screen. This function provides the facility to easily Add, Edit or Delete bank account transaction in Cashbook. Upon selection of this option, the system will display a list of transactions already entered into your main bank account. 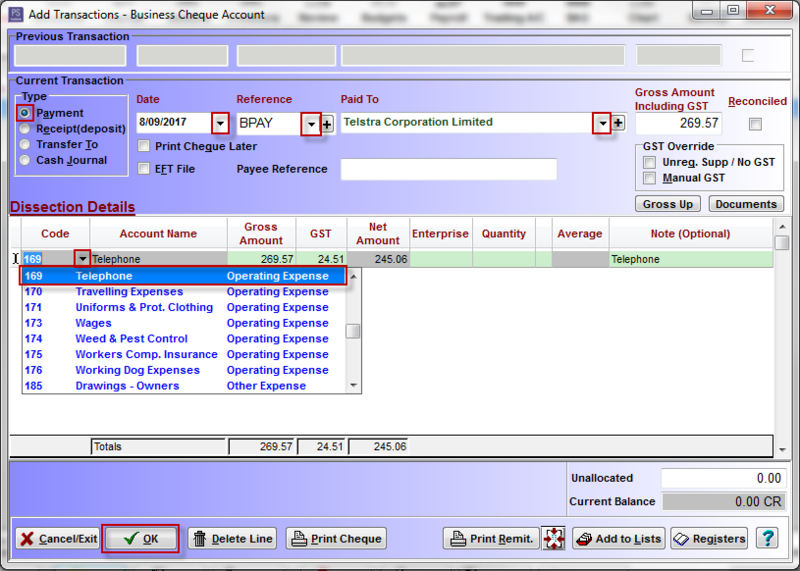 Change the sort order of the list of transactions to: Entry, Order, Date, Description, Reference or Amount. Type: Click on the Payment, Receipt (deposit), Transfer To or Cash Journal radio dial to select. 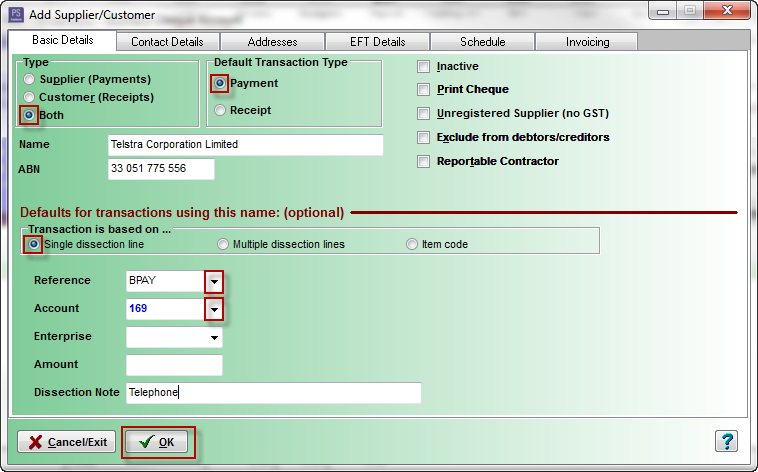 Enter the name of the Supplier or Customer name or select from the drop-down list. To activate SmartFind dynamic searching on he list, just start typing the name of the required item - the systems will refine the search as more key strokes are entered. When the required item is visible, simply press Enter key to move to the next field. If the Supplier or Customer is a new one, you can add them to the Supplier Customer list on the fly. Click on either Supplier (Payments), Customer (Receipts) or Both radio dial to select. Click on Payment or Receipt radio dial to select Default Transaction Type. Click on the Contact Details, Address, EFT Details, Schedule, Invoicing tabs and fill in any applicable information. Contact Details - enter contact name, phone numbers and emails as required. Address - enter contact address details as applicable. EFT - enter EFT banking details if applicable - this will be used in generating a file of transactions for processing with bank Electronic Funds Transfer software. Schedule - for regular payments to be processed automatically, complete schedule details for frequency, due date and number of pyaments remaining. Invoicing - enter name to appear on invoice, classification , term and note (to display/print on invoice screen for this customer/supplier) as required. Note: entering as much data for a supplier or a customer upon setup will simplify and speed up the data entry process. Gross Amount Including GST - amount of the transaction. Select an account Code from the drop-down list. e.g. 169 Telephone. Note (Optional) - enter a description that describes the transaction. e.g invoice number. The screen will automatically prepare for another transaction. Click on the Cancel button if you have no further transactions to enter. Once the transaction is added it will appear in the Cashbook transaction listing.